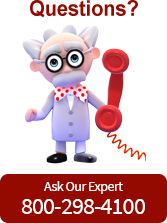 Pump Express system experts have been answering to the needs of the commercial, industrial and municipal markets in New Jersey and New York for more than three decades. Motors are our specialty. 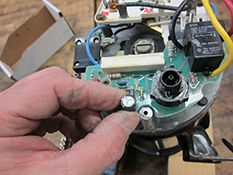 Our expert service technicians repair motors of every kind in our Northern New Jersey service facility. 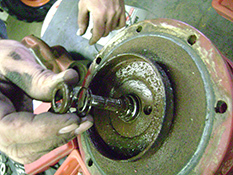 They examine the entire motor system and determine why the motor failed to help our customers prevent a recurrence. Speed and efficiency are priorities as we strive to get systems up and running as soon as possible. Variable Speed Motors- Variable frequency drive controllers are solid state electronic power conversion devices. The usual design first converts AC input power to DC intermediate power using a rectifier or converter bridge. The rectifier is usually a three-phase, full-wave-diode bridge. The DC intermediate power is then converted to quasi-sinusoidal AC power using an inverter switching circuit. The inverter circuit is probably the most important section of the VFD, changing DC energy into three channels of AC energy that can be used by an AC motor. These units provide improved power factor, less harmonic distortion, and low sensitivity to the incoming phase sequencing than older phase controlled converter VFD's. Our technicians are manufacturer-trained VFD experts. 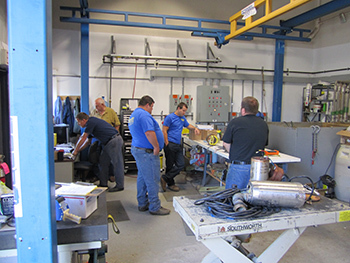 Laser Shaft Alignment– We use advanced precision laser alignment equipment to ensure proper shaft-to-shaft alignment. This reduces wear and tear to equipment as well as energy consumption. For detailed information on our Precision Laser Alignment Service, please click here. 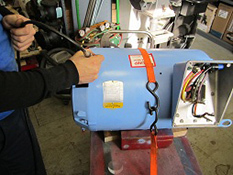 All of our repairs are carried out in accordance with government-sanctioned energy efficiency regulations for 1 to 500 horsepower AC motors..
For Service or to Request a Quote Click here or call a Pump Express Service representative Today!